The government of Canada has made it increasingly difficult for Mexican asylum seekers to find sanctuary there. This has resulted in an increase in deportees, many of whom face highly dangerous conditions upon their forced return to their country of birth. In response, migrants and activists in Montreal have organized to challenge Canadian policy, creating new webs of solidarity across international boundaries. In June 2009, in the state of Jalisco, Mexico, a woman’s body was found, “with blows to her body and a bullet in the forehead, a classic revenge from drug trafficking,” according to a local newspaper. Further medical investigation determined that the 24-year-old woman with the first name Grise had had a Caesarean just a month earlier, although the whereabouts of the baby was unknown. 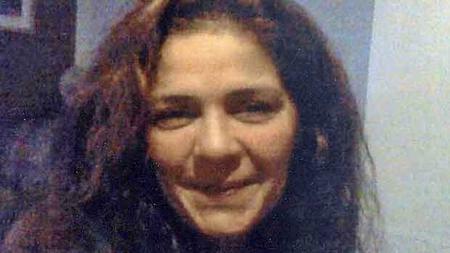 In January 2012, in the city of Hermosillo in the Mexican state of Sonora, a woman named Veronica Castro was “robbed and beaten,” dying three days afterwards. “When Castro died at 41,” reported CBC News in reference to her efforts to escape a long history of domestic violence, “she had spent almost half her life looking for a safe home without painful memories for herself and her son.” Veronica Castro. Credit: CBC. In addition to a violent end, these two women shared something else in common. They both had sought political asylum in Canada, a status that the Canadian government had denied them. Both also met their untimely deaths soon after Ottawa deported them to Mexico. These tragic stories draw our attention to a largely invisible phenomenon within the borders of North America, that of Mexican asylum-seekers in Canada. Instead of finding sanctuary, however, the majority, are experiencing rapid deportation back to Mexico. Between the mid-1990s and 2009, almost 50,000 Mexicans arrived in Canada to seek political asylum. Each year, however, as their numbers increased, the level of acceptance of their applications by the Canadian government steadily declined (30% in 1996 versus a low of 8% in 2009). This particular form of mobility between Mexico and Canada largely came to an abrupt end in July 2009, when, overnight, the Canadian government—under the leadership of Stephen Harper of the Conservative Party—imposed strict visa requirements on all Mexican travelers arriving in Canada. 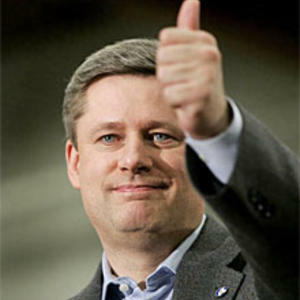 Stephen Harper. Credit: CBC.While this measure addressed all Mexicans hoping to travel to Canada, its primary objective was to stem the flow of asylum-seekers. Because asylum-seekers must physically reach Canadian soil to make an application, the visa requirement now makes it virtually impossible for someone from Mexico to apply for political asylum in Canada. Ottawa justifies this abrupt measure by asserting that most Mexican asylum-seekers are “false” or “bogus.” Indeed, during a state visit in 2010 by Mexican President Felipe Calderon, Harper spoke of a “torrent of bogus applications.” In the eyes of the Canadian government—the same one that has issued travel warnings for its own citizens travelling to Mexico (“exercise high degree of caution,” and, for northern states, “avoid non-essential travel"—they are simply economic migrants seeking to take advantage of a generous asylum system. 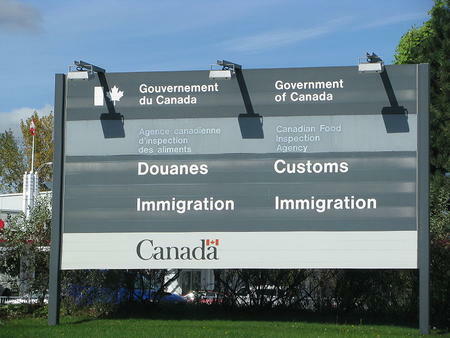 The Canadian government further affirmed this problematic and highly prejudicial position earlier this year via a major reform of the Immigration and Refugee Protection Act. Through this controversial reform, the Canadian government has created the category of “safe countries” (or “Designated Countries of Origin”), which promises to dramatically alter the way in which asylum-seekers from these countries are treated and processed. When the names of “safe countries” are announced sometime this fall, Mexico will surely be among them, given that the Canadian government has repeatedly used its fellow NAFTA-member-country as an example for justifying this new policy. Meanwhile, not only does the level of rejection for Mexican asylum-seekers remain high, it appears that Ottawa has accelerated the processing of cases to facilitate deportations of Mexic an nationals that now annually number in the thousands (in 2010, over 4,000 asylum applications were rejected. The assertion that Mexican asylum-seekers are “bogus” and the strong likelihood that the Canadian government will declare Mexico a “safe country” renders invisible the human costs of the multiple forms of political and social violence that currently wrack Mexican society. It dismisses long-standing patterns of targeted violence against journalists, political dissidents, and social movement leaders as well as social forms of violence that disproportionately affect women, homosexuals, and indigenous peoples, among other marginalized groups of people. A regime of impunity that systematically fails to bring perpetrators to justice further exacerbates these patterns. These “more traditional” forms of violence and impunity now intersect, however, with the spectacular and horrific violence associated with the current open war between the Mexican government and drug cartels. Conservative estimates indicate that over 55,000 people have died and over 150,000 people have been displaced as a result of this failed government strategy. In Montreal, Quebec, a city that is home to a significant number of Mexican refugees and asylum-seekers, there is an organization that is lifting its voice to challenge the Canadian government’s policies and to reaffirm the dignity of Mexicans who have made the difficult choice to seek asylum in Canada. 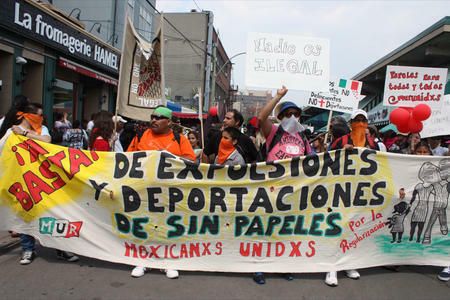 Since November of 2011, Mexicanos unidos por la regularización (Mexicains Unis pour la Régularisation, or MUR) has brought together Mexican asylum-seekers, refugees and allies to organize against current Canadian policies. In conjunction with vigils, marches and other forms of public protest, the MUR accompanies families and individuals as they move through the uncertain steps of their asylum cases. Credit: Annie LapalmeThe MUR has succeeded in creating webs of solidarity among a population that, given the nature of their presence and status in Canada, has remained largely in the shadows. As the Canadian government deports compañeros and compañeras back to Mexico, these webs of solidarity now extend across international boundaries. Given the highly restrictive climate of Canadian security and immigration debates, the organization faces almost impossible odds in achieving visible shifts in current policy. Yet the organization still accomplishes vital political work. 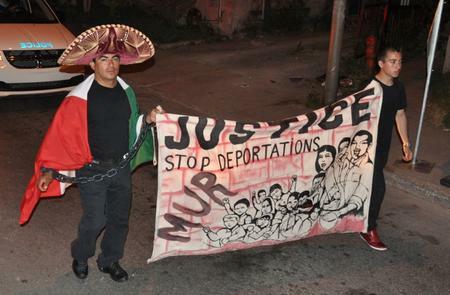 Through their involvement with the MUR, certain Mexican asylum-seekers in Montreal have found a means for recovering their humanity, dignity, and self-esteem as they denounce publicly the injustices, violence, humiliation, and exploitation that they have experienced (be it in Mexico, the United States, and/or Canada). These individuals help to bring to light the various transnational forms of impunity and violence that underpin Mexican migration, while making known the precarious conditions under which many asylum-seekers live. In so doing, they demonstrate the distorte Credit:: Annie Lapalme.d and misplaced nature of Canadian immigration policy. Through the MUR, Mexican asylum-seekers have begun to challenge and deconstruct the destructive discourses woven into the label of “false” or “bogus” asylum-seeker. The experiences and life stories of Mexican asylum-seekers indicate that Mexican mobility is not simply a bilateral issue between the United States and Mexico. This poorly understood phenomenon redraws the history and geography of Mexican migration in North America, while destabilizing the entrenched stereotype of Mexican migrants as “simply” economic migrants. It also brings into shape focus the Canadian government’s proactive role in hardening borders against the people of Mexico. These trends should encourage scholars and activists alike who are concerned with Mexican migration in North America to enlarge their fields of analysis and action. Patricia Martin is an Associate Professor of Geography at the Université de Montréal. A specialist in Mexican politics and development, she is currently conducting research on various forms of social and political violence in Oaxaca. Annie Lapalme is a graduate student at the Université de Montréal. She’s currently completing a master’s degree in Geography with a research focus on Mexican asylum seekers in Canada. She is an active member of Mexicanos Unidos por la Regularizacion as well as others migrant justice advocacy groups in Montreal. For more from the Border Wars blog, visit nacla.org/blog/border-wars. And now you can follow it on twitter @NACLABorderWars.